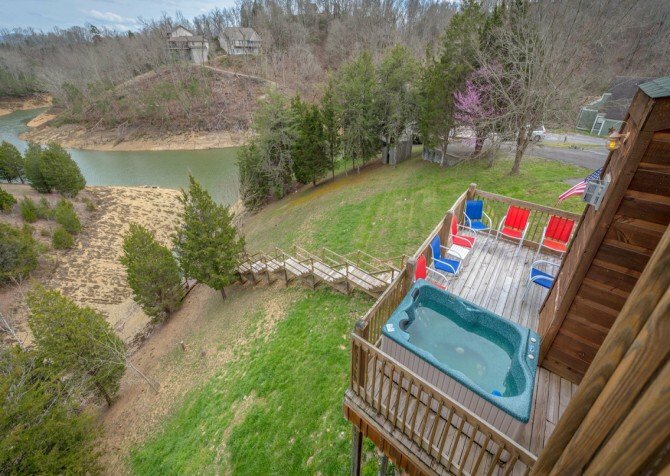 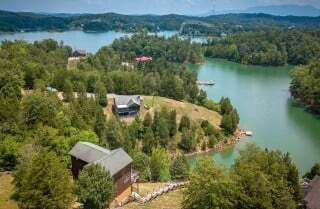 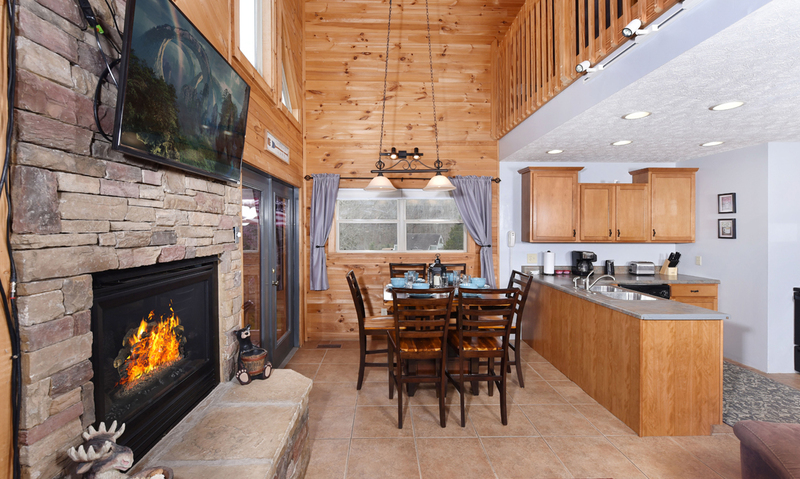 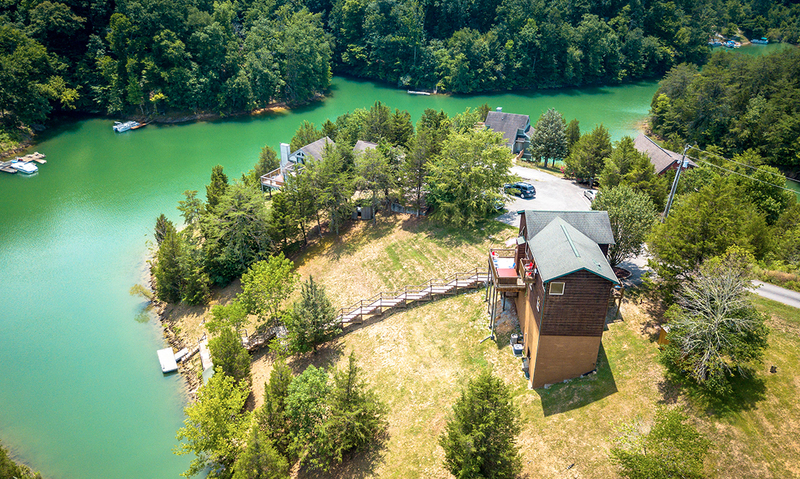 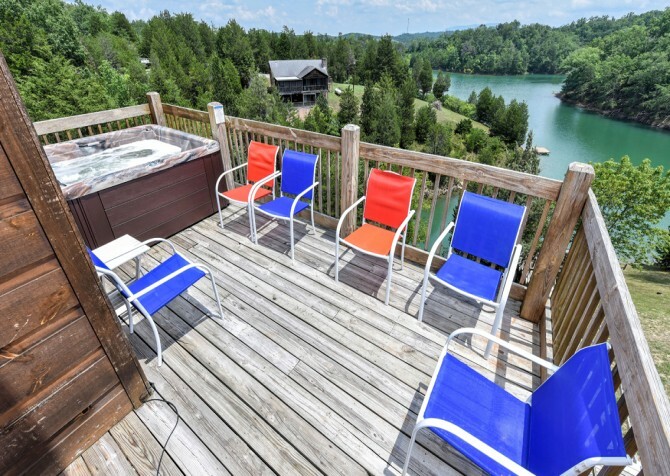 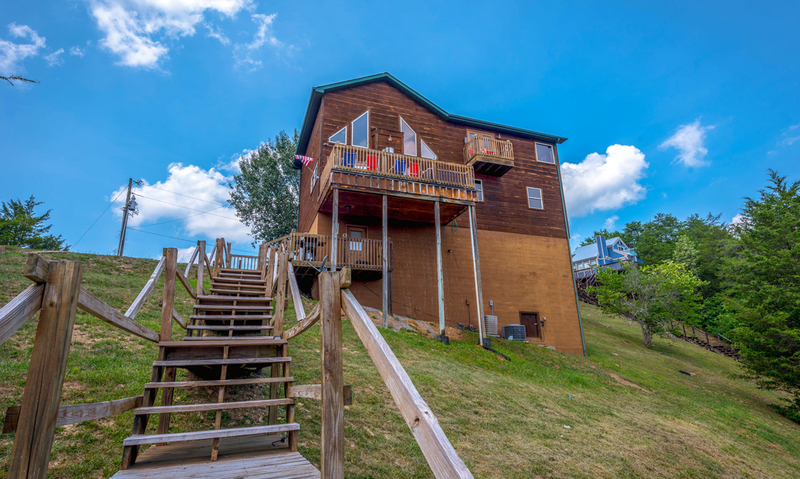 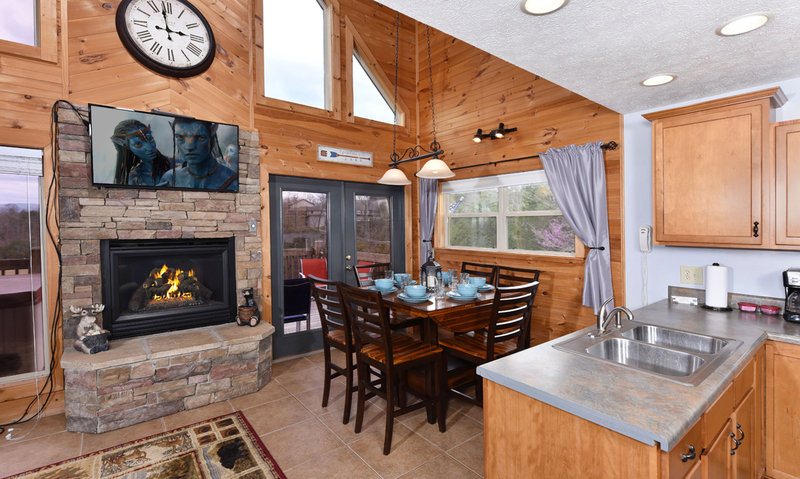 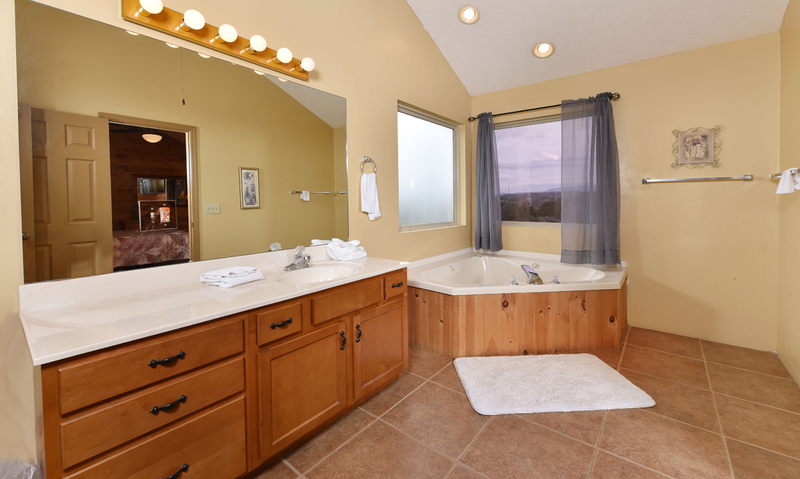 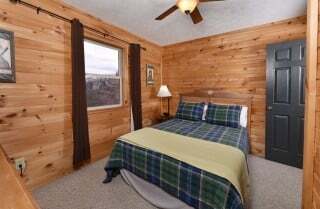 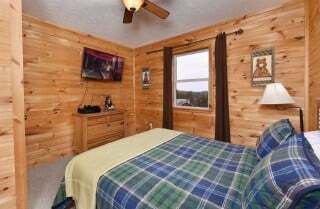 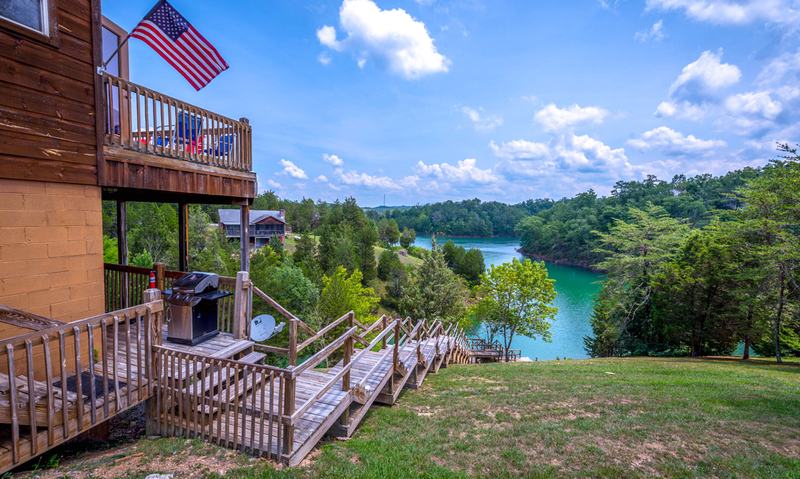 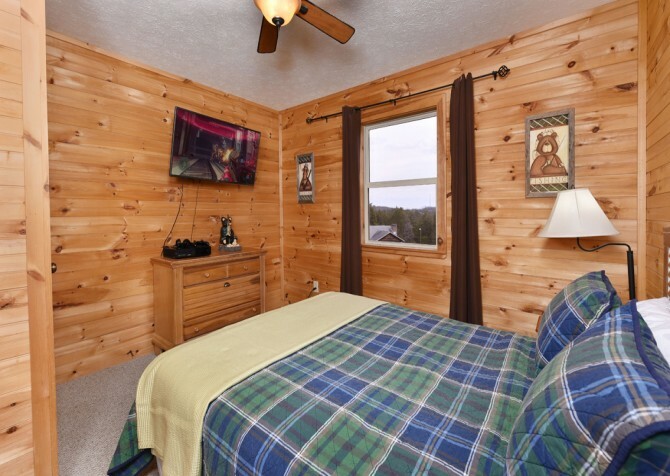 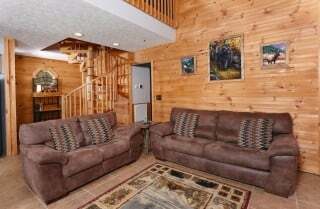 Slip away for lakeside relaxation with family and friends at Lakeside Mountain Memories, a lovely 3-bedroom, 2-bathroom cabin for 10 that’s pet friendly and filled with amenities! 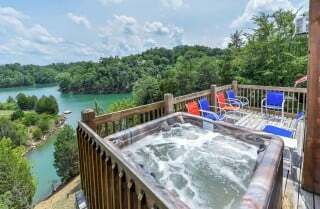 Plus, it’s far enough from the city to reconnect with nature but close enough to grab a quick bite to eat or play all day at the many attractions in Pigeon Forge. 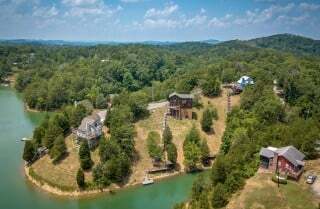 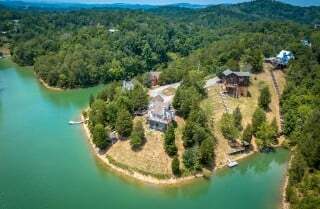 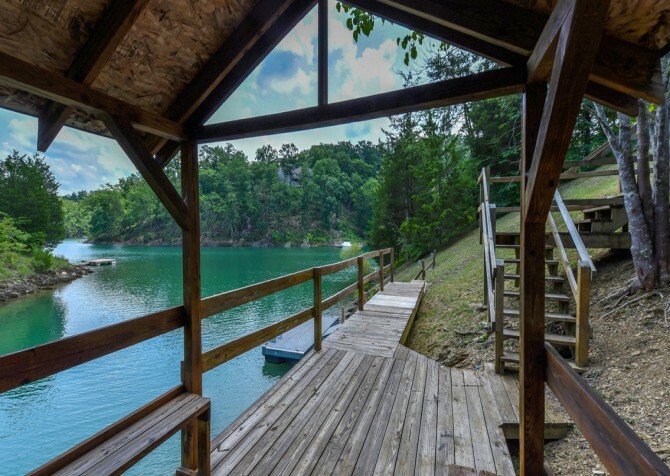 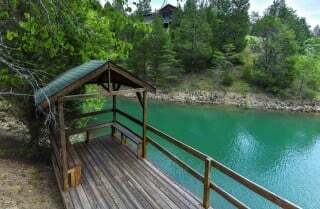 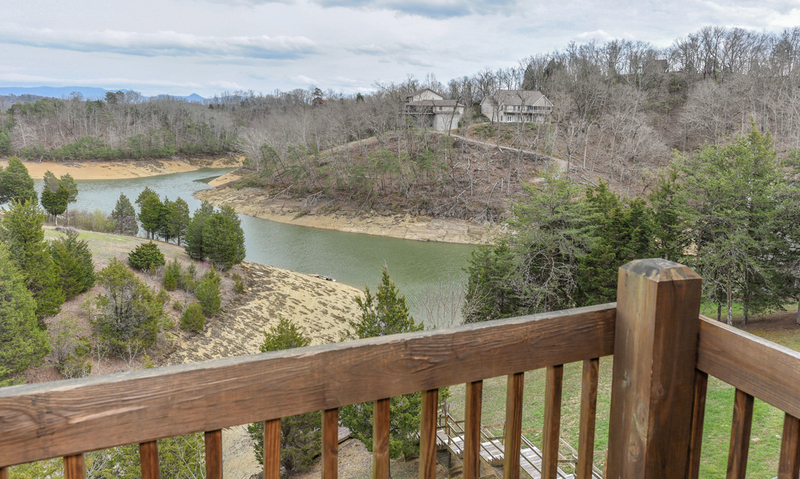 Perhaps best of all, you can enjoy gorgeous views of Douglas Lake and English Mountain from the covered sitting area and private floating dock at the lake! 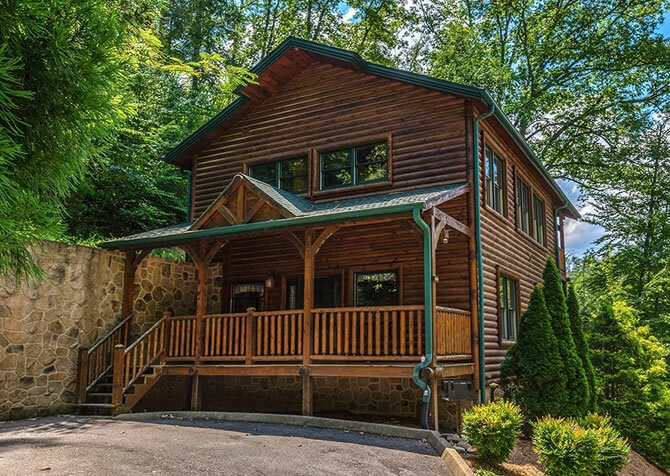 Start your adventure with a fun drive on paved roads to your cabin — a stress-free start to a Smoky Mountain getaway. 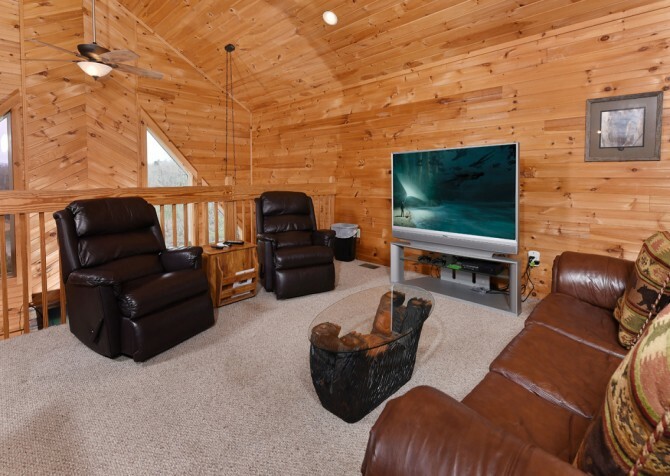 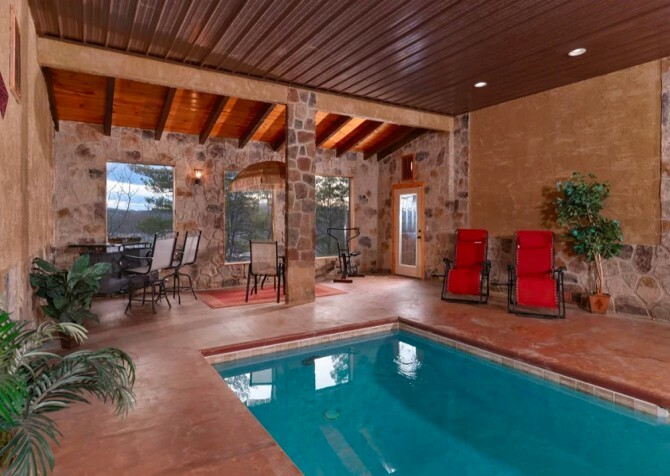 Then head inside to unwind in the outdoor hot tub, cozy up in front of the fireplace, and flip on the big screen TV for movie night. 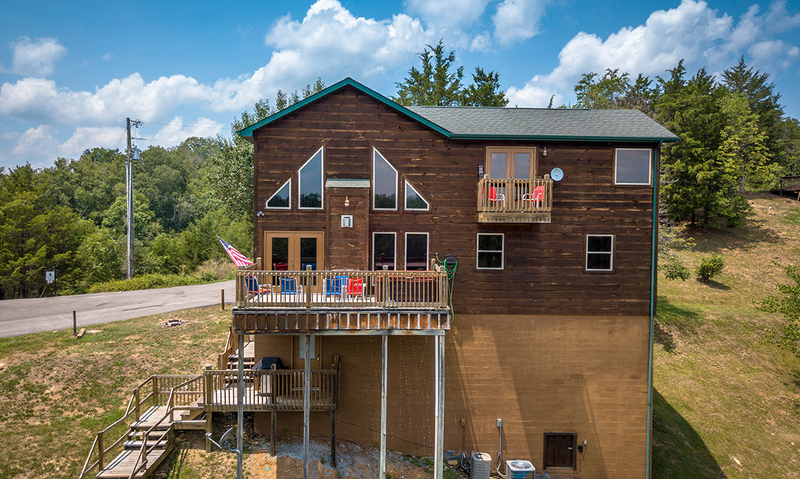 Packed with plenty of books, puzzles, and board games, this home away from home is perfect for those lazy after-fun-on-the-lake days. 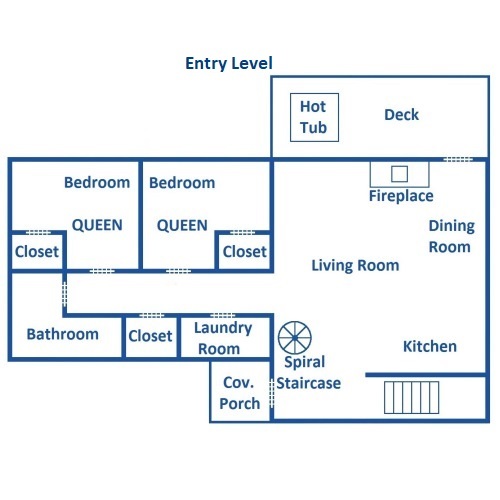 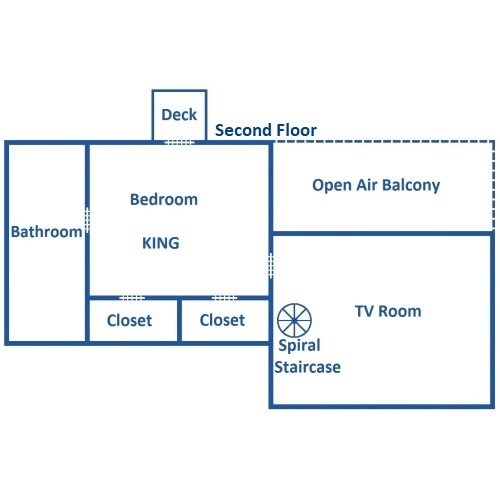 Add a pool table, DirecTV satellite, a fully equipped kitchen, and a master suite with a private deck, and leaving may be more difficult than you imagine. Step into the cozy living room to view the Great Smoky Mountains through the floor-to-ceiling windows, plop on the plump sofa or love seat for a cat nap after your travels, or watch the big game on the big screen TV via DirecTV satellite — which can be used simultaneously on 4 TVs throughout the home! With easy access to the entry-level deck, feel free to have a seat and relax outdoors with an even better view of the lake. 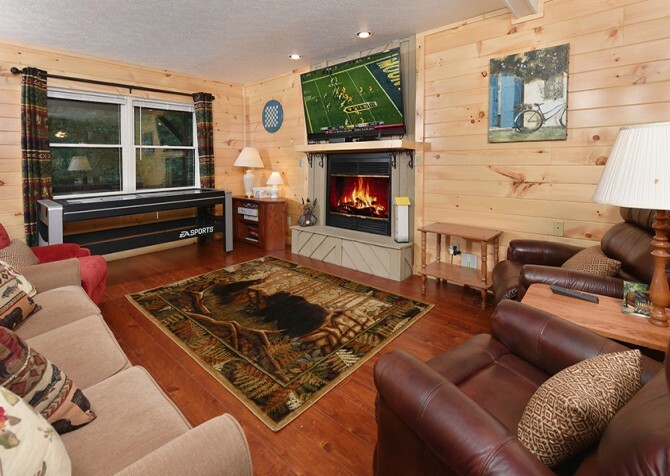 When a cool breeze brushes by, head back inside to warm yourself by the gas fireplace. At the end of the night, chat with your bestie or a snuggle with your spouse in this inviting living space. When the sun rises, make your way to the fully equipped kitchen to brew a pot of joe with the coffeemaker, prepare eggs and bacon on the stove, brown bagels in the toaster, and rinse fresh fruit in the stainless-steel double sink. At lunchtime, whip up sandwiches with a few ingredients from the fridge and bake sugar cookies with the family after the food settles. Keep cool on summer days by whipping up your own frozen dessert at home with the cabin’s old-fashioned ice cream maker — sure to be a hit with the kids. Instead of cooking a meal in the evening, toss tender cuts of beef and locally grown vegetables into the provided crockpot earlier in the day so you can serve dinner hassle-free! 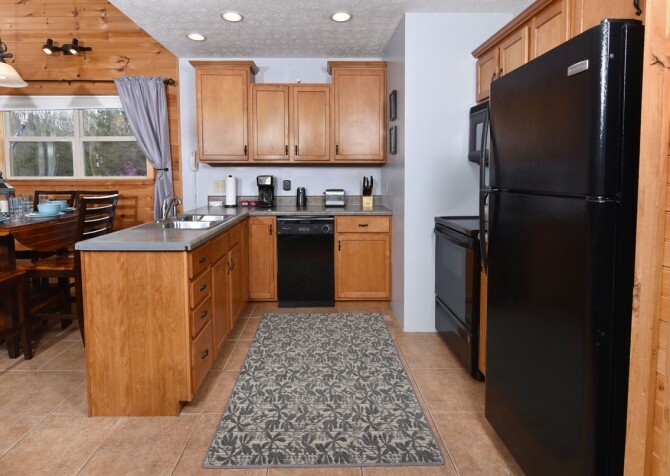 While the standard appliances and welcomed extras this kitchen provides may be essential on your trip, there is one feature sure to beat them all — the dishwasher, provided to make your vacation life that much easier. 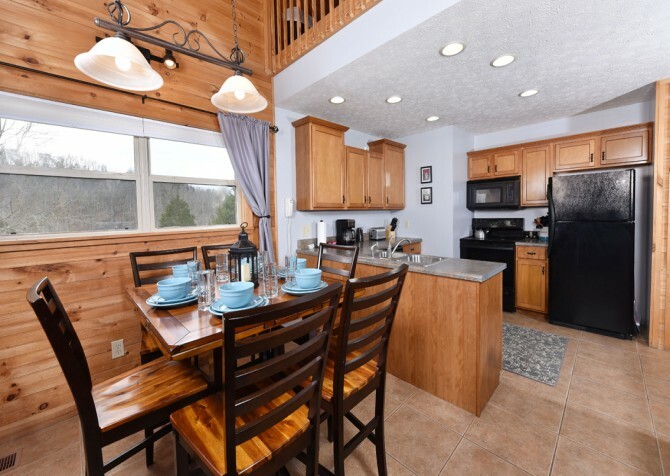 Boasting an extendable wooden table for 6, the serene dining space is just off the kitchen for your convenience, making serving up meals easy as pie (which we highly recommend for dessert). With tree-studded views to enjoy, dining will certainly be an absolute delight. When mealtime is over, extend the table for a puzzle challenge to see who can put their image together the fastest. 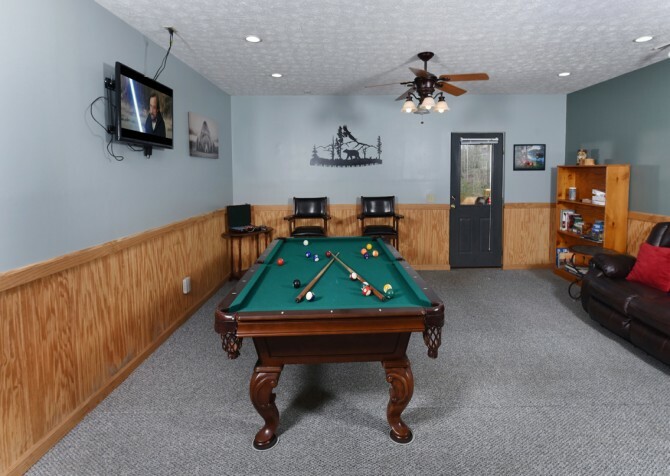 Better yet, grab a board game from the loft and host a game tournament to end them all! This is your vacation — spend it however you please. 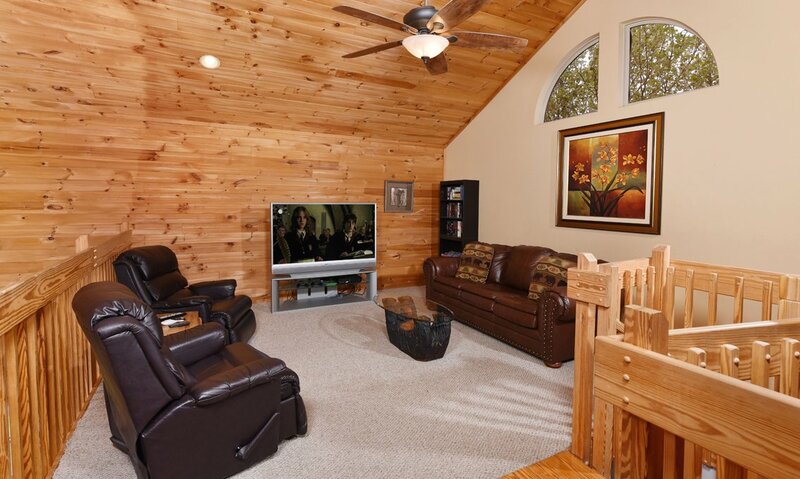 Looking for a place to relax and unwind with a movie? Head up the whimsical spiral staircase and straight for the loft, where you can flip on the TV, pop in your favorite DVD, and chill in the 2 recliners to top off the night. 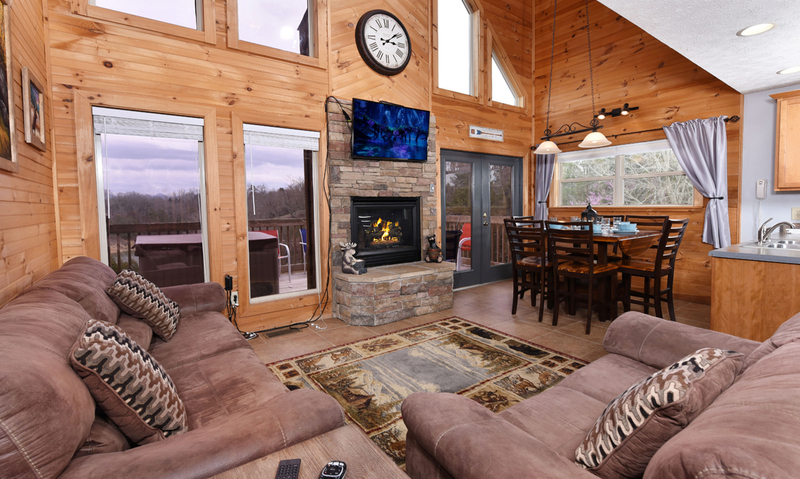 With snacks piled high on the coffee table, what could be better? There is also a queen-size sleeper sofa here, and you can grab a book off the bookshelf and dive right in. 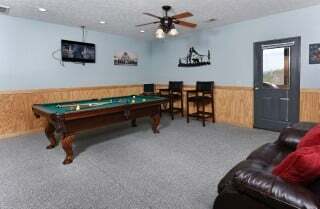 While the kids hang out upstairs, venture downstairs to the rec room for a few rounds of casual pool or a competitive poker match. 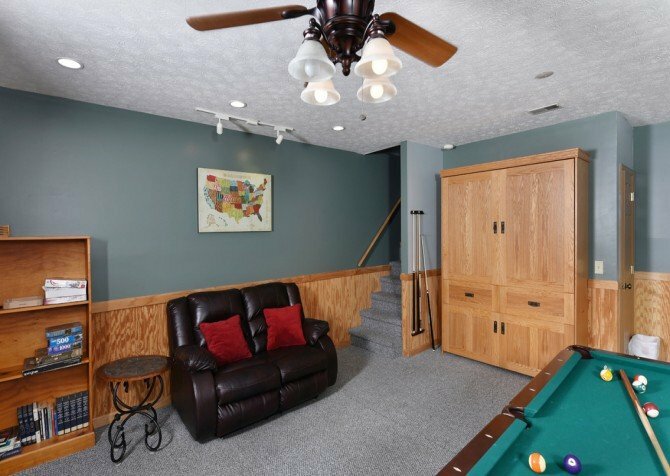 If you’re up for something a touch more challenging, toss down the Twister mat and prove your flexibility…or “accidentally” bump your sibling at the last second (your secret’s safe with us). 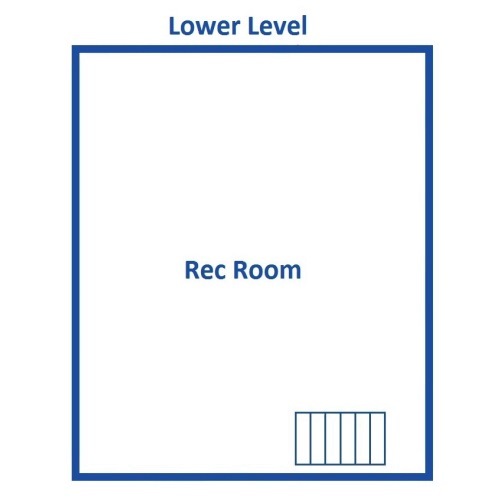 Not interested in a test of physical ability? 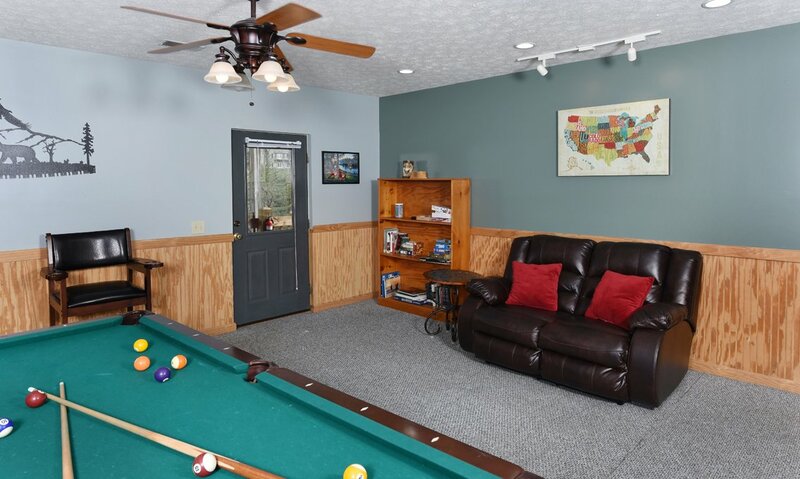 Challenge everyone to a contest of wits with Scrabble — classic. 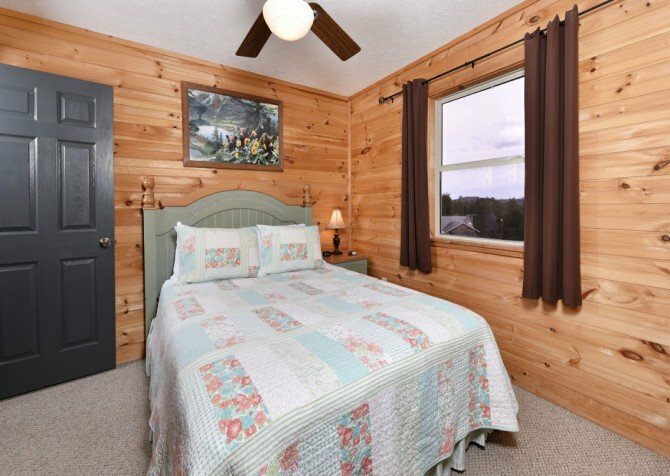 Next to additional board games and puzzles, more novels await so book lovers will feel at home, too. 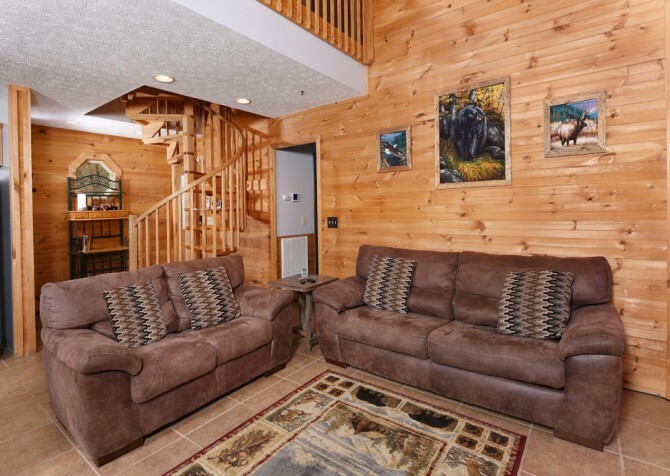 Simply curl up on the love seat and let the adventure begin! At the end of the gaming frenzy, pull down the queen-size Murphy bed, slide into the soft sheets, flip on the mounted flatscreen TV, and catch up on your favorite shows as you head to dreamland. 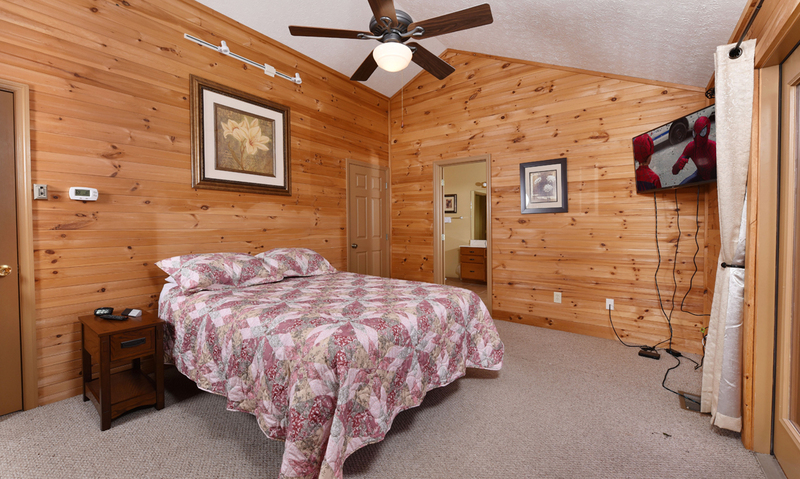 At night, head to one of 3 comfortable bedrooms — each with a queen-size bed, ceiling fan, and large flatscreen TV. For even more relaxation, choose the master suite — complete with a queen-size adjustable sleep number bed, private balcony, and jetted tub. 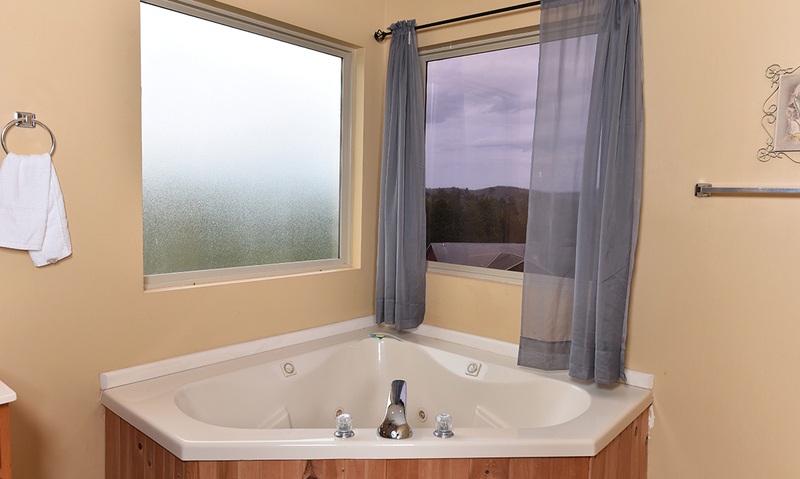 Before bed, light a few scented candles, unwind with a bath bomb, and view elegant shades of purple over English Mountain as the sun sets. 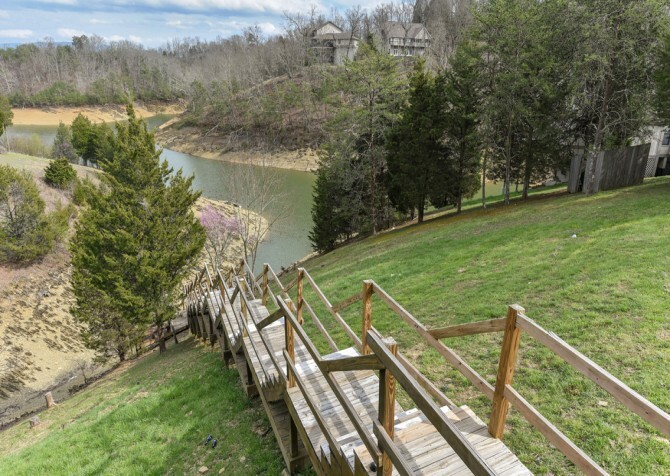 If you’re lucky, you may even get a chance to see the moonrise over the mountain and lake. 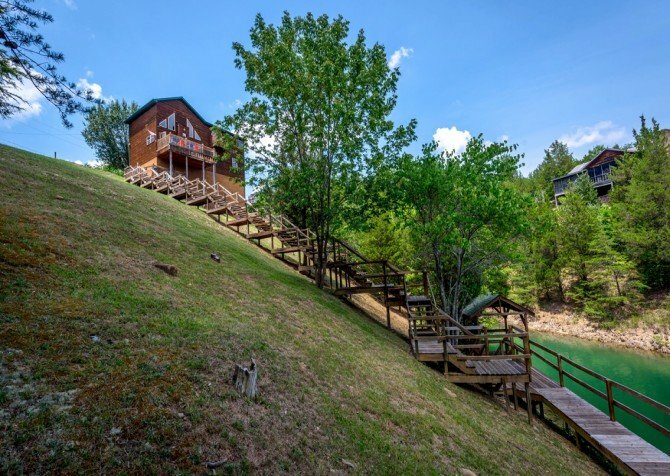 Keep your eyes peeled as it’s quite the sight! 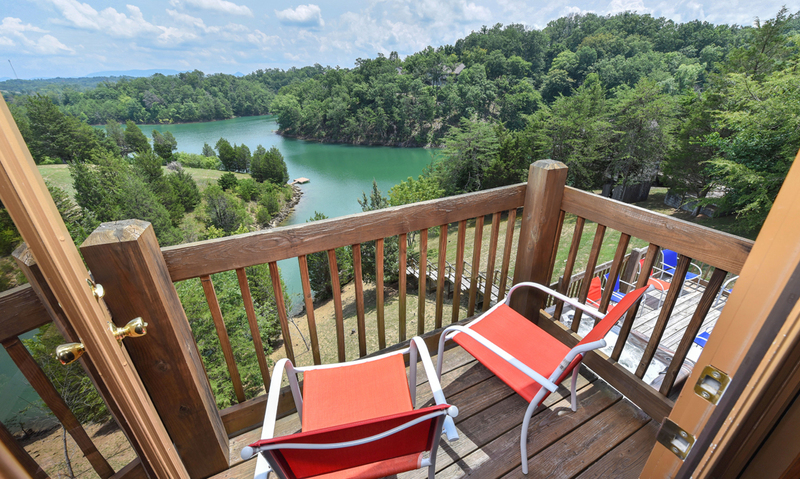 Lakeside Mountain Memories has tons of amenities, but the gorgeous views and easy lake access in a cove off Flat Creek are hard to beat! Spend quality time with family and friends down by the private floating dock, featuring a ladder for easy in-and-out when you want to swim. Though, jumping in may be the best course to take. 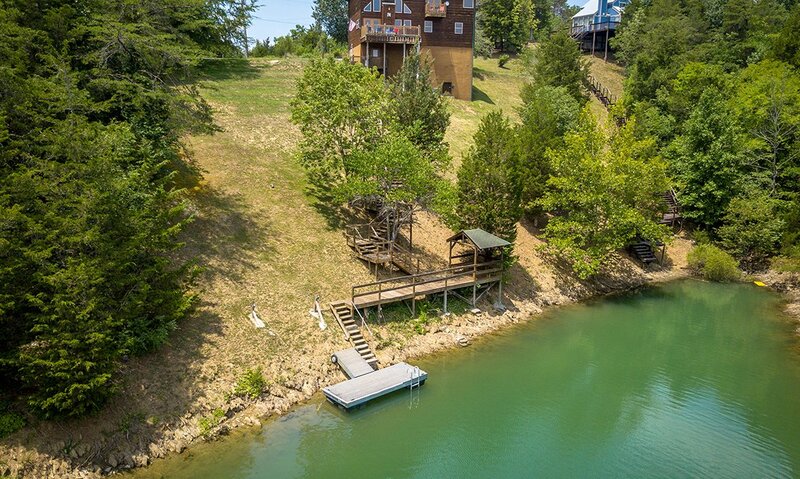 Better yet, take your boat or jet ski to launch a couple miles down the water — and dock your watercraft at the house! 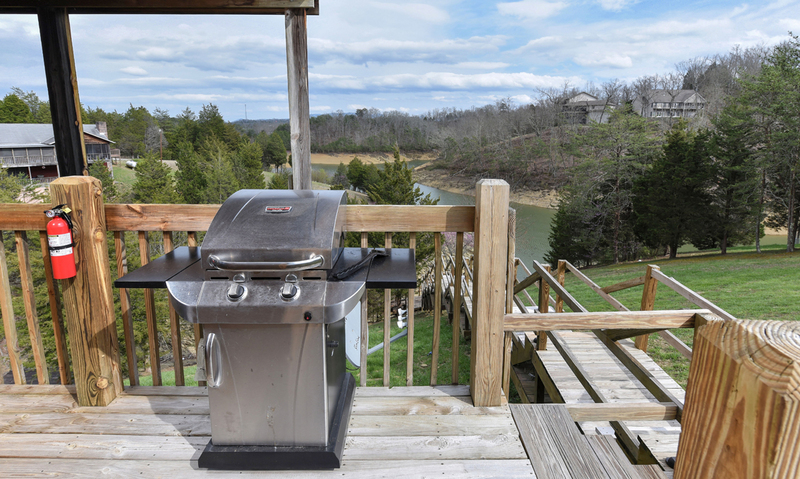 After a few hours of waterplay, relax with a cold drink and tasty barbecue off the grill (gas or charcoal) while enjoying tranquil views of Douglas Lake from the covered sitting area. 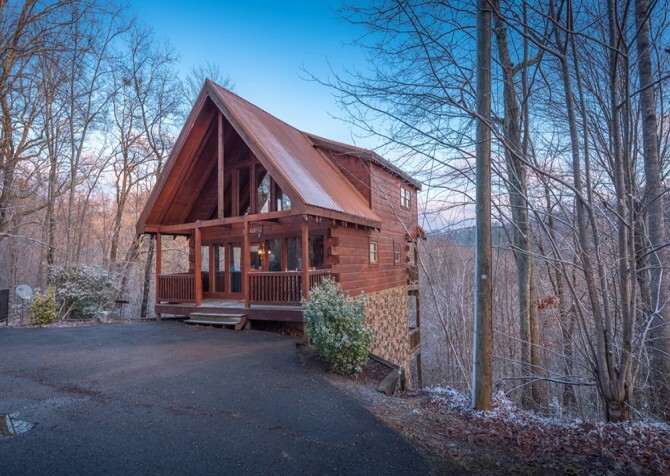 As sunset falls behind the cabin, watch English Mountain turn a gorgeous shade of purple! Pro tip: be sure to scan the skies for the 2 bald eagles that nest to the south circling the ridge as they hunt and play. Nighttime walks to the lake are made easy with the illuminated steps, and you may spot some deer grazing along the mountainside! 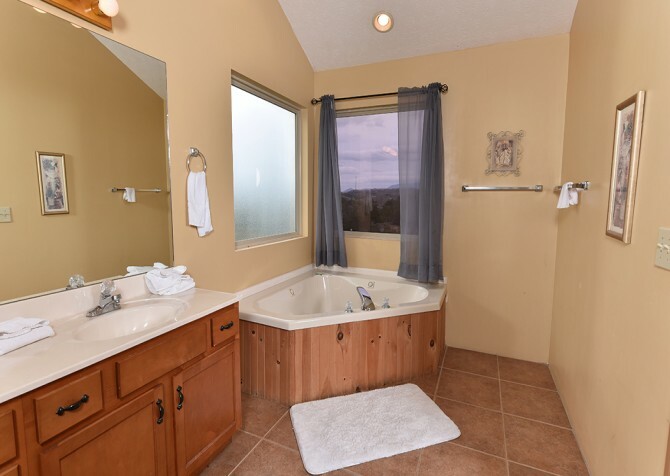 Or you can grab your swimsuit and take a dip in the outdoor hot tub to soothe those tired muscles. 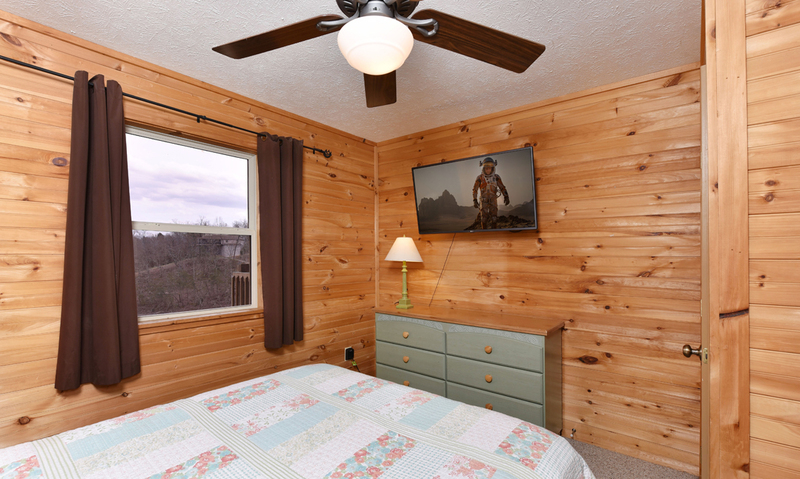 This semi-private cabin also boasts a flat, paved driveway with parking for 4 and room for a trailer. 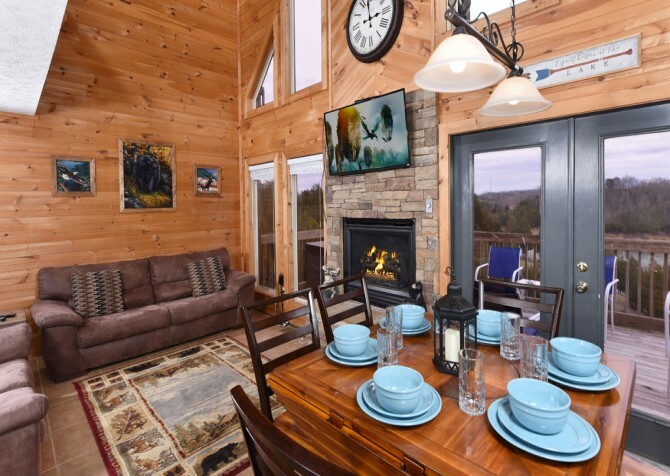 When you arrive, leave your bags in the car and make your way up 10 steps to the entry-level deck to take in the mountain, wooded, and lake views all in one. 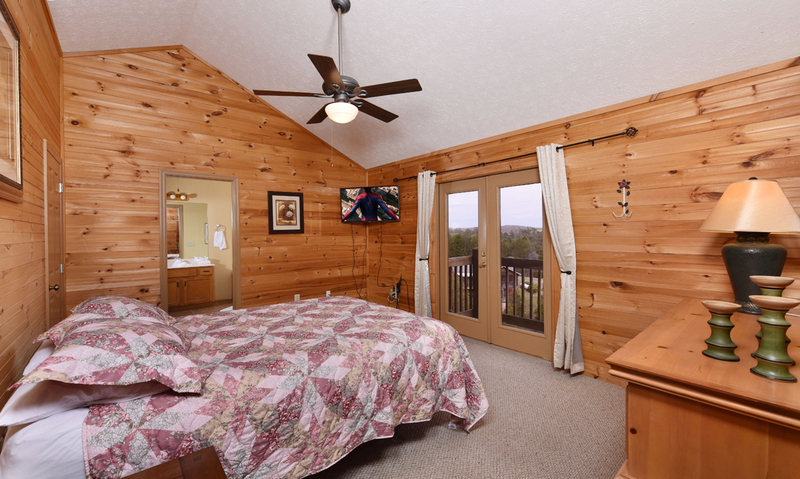 In the morning, take to the private deck off the master suite to witness gorgeous sunrise views. 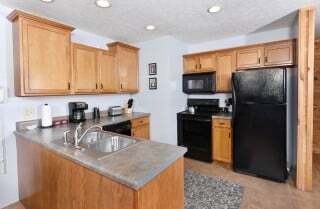 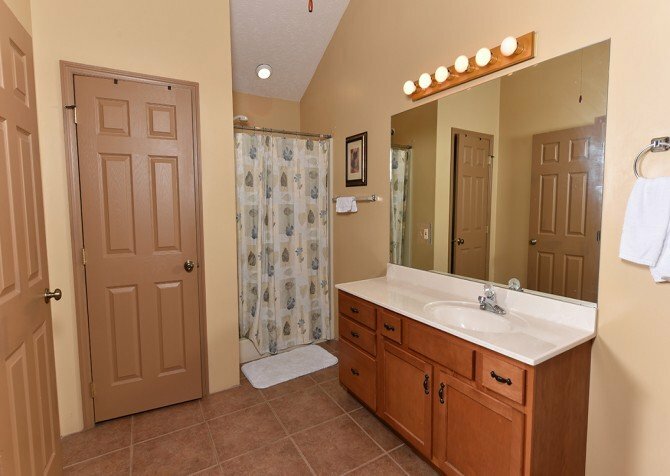 Homey conveniences are here for YOU! 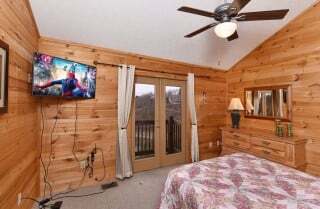 Use the landline to make local restaurant reservations for your special night out, take advantage of the complimentary wireless internet to stream TV shows, and utilize the washer and dryer to cut down on packing. Perhaps the best amenity of all is the ability to bring your beloved pup along for your Smoky Mountain trip as this cabin is pet friendly! Take a 15-minute drive down the hill to Pigeon Forge attractions, dinner shows, delicious restaurants, shopping centers, outdoor activities…the list goes on and on. Celebrity restaurants, the Great Smoky Mountain Wheel, boutique shops, a ropes course, a kids’ train, ice cream and gourmet treats, The Escape Game, a spa, old-timey shops…there is no shortage of fun and entertainment at The Island in Pigeon Forge! 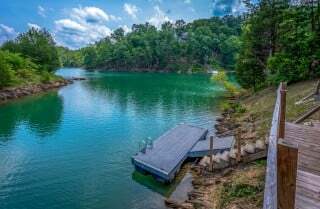 Go for a wildlife experience at Rainforest Adventures Discovery Zoo, harboring turtles, kinkajous, lemurs, macaws, and more! Featuring 54 holes of putt-putt fun, Ripley’s sure knows how to host a mini golf competition between family and friends.